Directions (Q. 1-5) Read the following information carefully and answer the following questions carefully. Inlet pipes A, B and outlet pipe S took 10 hours to fill the empty tank then find how much time Pipe S will take to empty a full tank? Time required by S to empty the tank= 420/23= 18(6/23) hours. Inlet pipe E and outlet pipe Q can fill the empty tank in 42 hours then how much time is required for inlet pipe C if it is opened with outlet Q to fill the tank? Time required by Q to empty the tank= 210/2= 105 hours. Time required= 630/29= 21(21/29) hours. Inlet pipes B, C and D were opened to fill tank so after how much time pipe C should be closed so that the tank gets filled in 8 hours? Time after which pipe C should be closed= 48/28= 1(5/7) hours. So the time required to fill the tank= 24 hours. The time taken by inlet pipe D and outlet pipe P to fill the tank is 2 hours less than time taken by inlet pipe C and outlet S to fill the tank then find the time required by outlet pipe S to empty the full tank if the outlet pipe P can fill the empty tank in 40 hours? Time required by pipe S to fill the tank= 558/22= 25(4/11) hours. The following bar graph represents number of days taken by husbands and wives of six different families to complete a piece of work. If the husband of Sharma, Chaudhary and Singh family works together, in how many days the work will be completed? Let the work will be completed in x days. Time taken by Malhotara family to complete the work is what percent of the time taken by Banerjee family to complete the work? If Banerjee family and Chaudhary family works together, in how many days the work will get complete? Let the work will get complete in x days. If the husband of Chaudhary family worked for 3 days and then left, in how many days Deshmukh family can complete the remaining work? Let Deshmukh family can complete the remaining work in x days. 10. Find the time required by wife of all the families to complete the work. 1. Inlet pipes A, B and outlet pipe S took 10 hours to fill the empty tank then find how much time Pipe S will take to empty a full tank? 2. 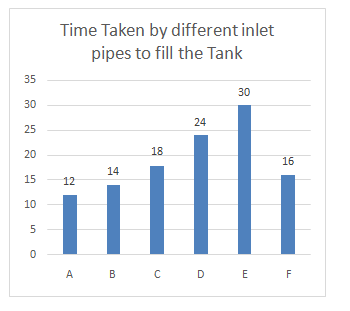 Inlet pipe E and outlet pipe Q can fill the empty tank in 42 hours then how much time is required for inlet pipe C if it is opened with outlet Q to fill the tank? 3. Inlet pipes B, C and D were opened to fill tank so after how much time pipe C should be closed so that the tank gets filled in 8 hours? 5. The time taken by inlet pipe D and outlet pipe P to fill the tank is 2 hours less than time taken by inlet pipe C and outlet S to fill the tank then find the time required by outlet pipe S to empty the full tank if the outlet pipe P can empty the full tank in 40 hours? Find the time required by wife of all the families to complete the work.